Cool down this Summer with these 15 non-alcoholic Refreshing Summer Drinks – lemonades, iced lattes, infused waters, fruity iced tea and more. These drinks are all natural, REFINED SUGAR-FREE, packed with amazing flavors and above all super easy to whip up. Cheers! Nothing is better than an afternoon spent in a shade on a terrace with an ice-cooled drink in a hand. When summer heat strikes many people reach out for a cooling store-bought beverage that is usually loaded with added sugars and artificial flavors. This summer you can enjoy your favorite cooling drink but with less sugar and much more natural flavors. Check out this amazing collection of 15 non-alcoholic Refreshing Summer Drinks. From simple sugar-free lemonades to zero-calorie lattes, infused waters and fruity iced teas… these drinks are ALL NATURAL, REFINED SUGAR-FREE, easy to whip up and above all HEALTHIER than any store-bought stuff. Cooling, creamy and just delightful, this Iced Coconut Matcha Latte is just what you need this summer. It’s packed with powerful antioxidants and amazing green tea coconutty flavor. This refreshing Iced Coffee Protein Shake will make any day so much better. It’s nutrient-packed, satisfying, and super HEALTHY – made with only NATURAL real ingredients. NO store-bought protein powders. NO artificial sweeteners. In this tart, tangy and delicious drink, Earl Grey tea is mixed with orange infused water and fresh lemonade. It’s honey sweetened and so refreshing. This Watermelon Lemonade requires only 3 ingredients for an easy refreshing summer beverage. Perfect to serve when hanging out on a hot summer afternoon with family or friends. This refreshing Cucumber, Mint and Lemon Fizz will cool you down and keep you hydrated, without having to reach for sugary drinks. It’s easy to whip up a big batch of it and it will look super impressive on the table at your next BBQ. This Watermelon Cucumber Mint Juice is absolutely refreshing. It’s made with all natural and organic ingredients. Perfect drink to cool down this summer your whole family will love. 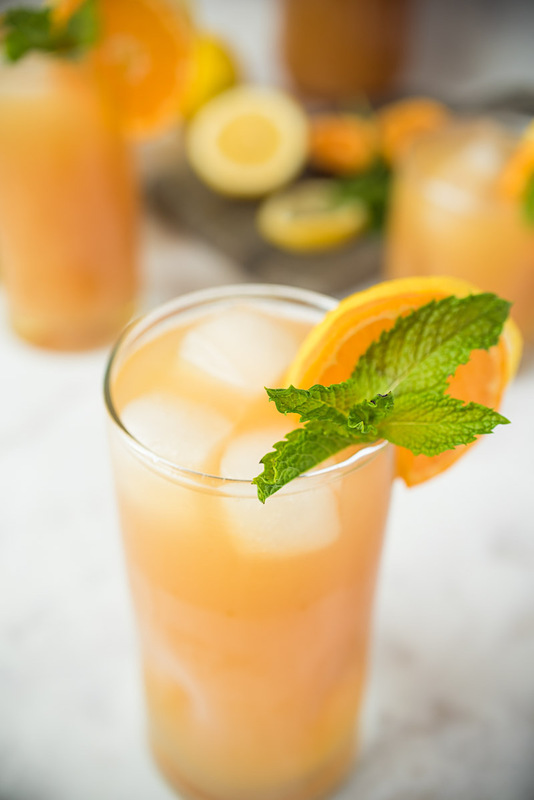 This Peach Ginger Iced Tea is a refreshing glass of iced green tea, sweetened with fresh peaches and flavored with ginger and honey or syrup. 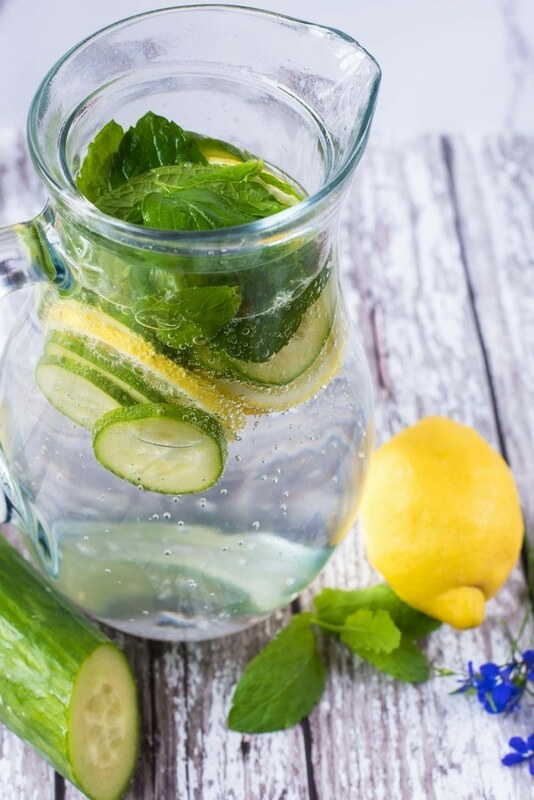 So good, so healthy, and so refreshing! It’s the creamiest coffee ever that’s deliciously sweet, and it basically tastes like coffee ice cream in liquid form. Flavored with almond extract and cardamom this Coconut Milk Thai Iced Coffee is truly authentic. It’s seriously the best combination of flavors. 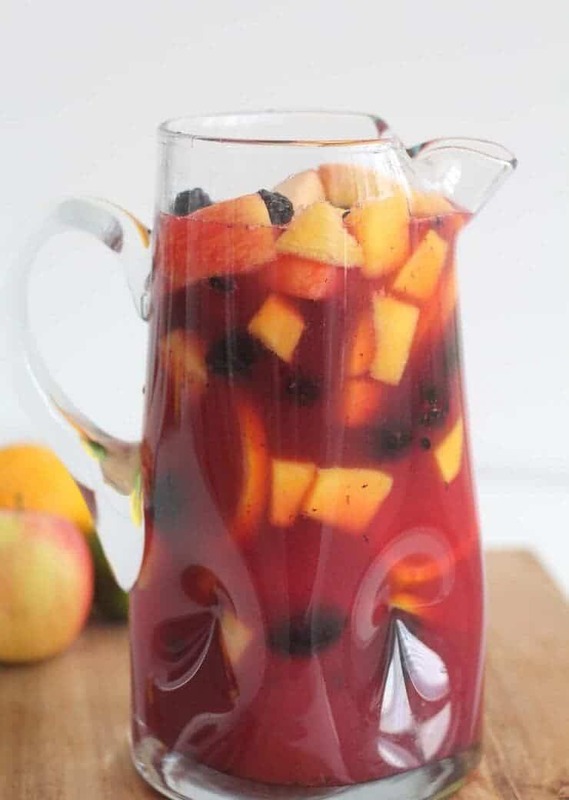 Non-Alcoholic Sangria is a fresh and fruity virgin sangria recipe that makes the most refreshing drink for any event! This frosty tropical cocktail is made without the alcohol and right in a blender with just 3 real ingredients! Virgin Banana Daiquiris is completely sugar-free you and even the kids can enjoy this healthy recipe! The easiest sugar-free lemonade recipe ever! All you need is 3 simple, natural ingredients and 5 minutes, and you’ve got delicious healthy lemonade without sugar. 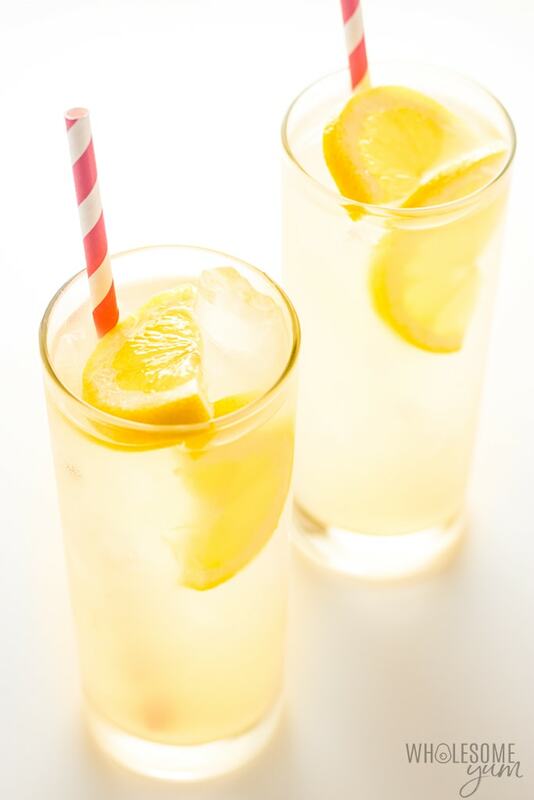 During a hot summer day, there’s nothing quite as refreshing as a cool glass of lemonade. Relax and recharge with this delicious, health-infused paleo and keto-friendly Fizzy Ginger Lemonade. 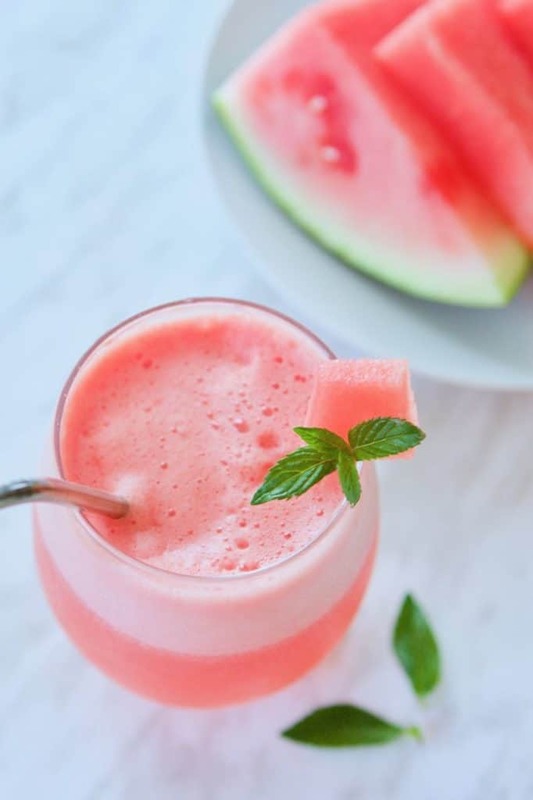 Enjoy this refreshing probiotic drink made with watermelon and kombucha. It’s completely sugar-free, made with 3 easy ingredients, so refreshing and healthy. Energizing Blueberry Lime Chia Fresca is perfect refreshment for hot Summer days. It’s loaded with healthy stuff, all natural and refined sugar-free. 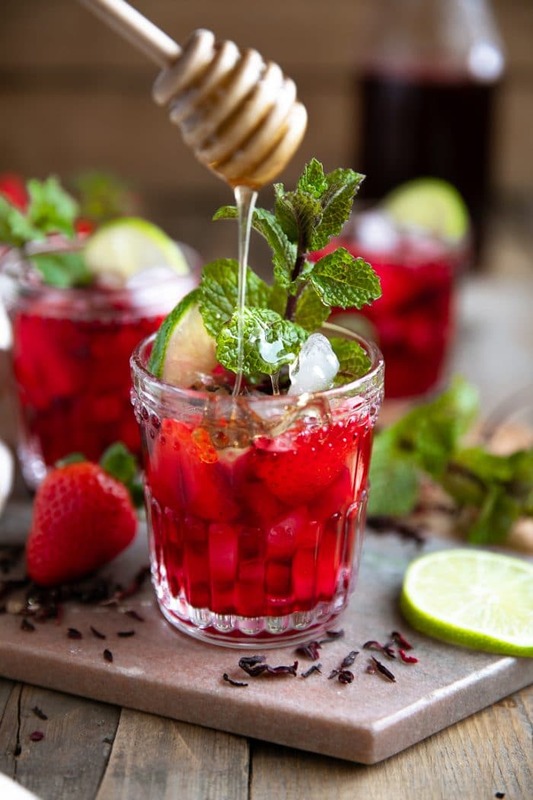 This Strawberry Honey Hibiscus Iced Tea is made with fresh strawberries, dried hibiscus flowers and sweetened with honey. It’s easily made and so refreshing. You’ll be drinking this drink all summer long.